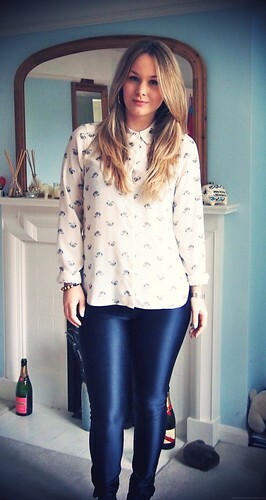 So I finally ended up getting some Disco Pants from American Apparel. I actually bought them just after Christmas but then took them back because I wasn't sure. Ever since I've still be umm-ing and ahh-ing and after a spur of the moment ebay bid they came back into my life again. Now I'm going to be frank, the reason I initially took them back was because I was conscious of how my legs looked in them. I wear a size 12 in trousers, I have 'shapely' thighs and short legs as a whole. However, in the end I just didn't really care. I really like the Disco Pants, and yer I'm sure they look better on a size 8 but I like them so I thought why the hell not. I went through a couple of outfits I thought I could wear with them (in part so I can justify the expenditure). Also, just to point out they are black..look quite navy in the pictures. I'd love to know your thoughts! Ah I'm the exact same, I'd just kept seeing disco pants on size 6/8s on all the blogs and youtube videos so I chickened out of buying them, and still aren't brave enough to buy them. They look great on you though :) Also am in love with your jumper! 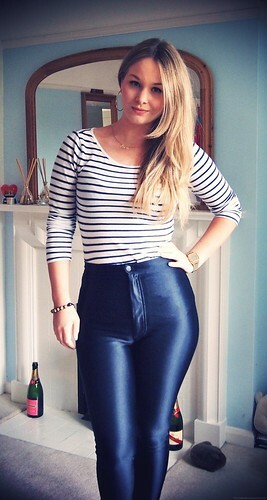 I'm with you...in my head Disco Pants just aren't for people with curves, but actually these look fantastic on you! And please note, I donn't mean "curves" in that patronising way people use to mean chunky...you have a lovely figure! Just that it's good to see that Disco Pants really are flattering for all shapes and sizes, not just bean poles! Wow I am in love with those pants, that was £70 well spent hun! You absolutely rock these! Embrace your figure, you've got a killer one! I am tempted to buy these aswell and have the same problem as you, I feel like my legs/hips may look bad in them! After seeing them on you I think I might get them because they look really good on and it looks like you can definitely dress them up or down. They suit you so much! Love the second outfit. So pleased I have seen your blog cute !!! I´m curious what size did you get in them? I´m planning to get some and I am also a size 12 :) They look great on you!!! I always think these look so good on other people but I just do not think I can pull them off! I love the first two outfits, Louise! I also still love that maroon jumper! I have it in mustard but couldn't get it anywhere in maroon and I remember you wearin it for ACS drinks at Urban Village ages ago!